Tag Archives: Pathephone Record Player 1916. Pte BERTIE HIBBETT: LETTER to Mother, Marie Neal HIBBETT, 95, Foden Rd Walsall. I received your very welcome letters dated Dec 11th & 12th (Sat & Sun) on Dec 14th & 15th (Tue & Wed) respectively & indeed did receive them with respect. But on Thursday night your two Christmas parcels had not yet come & on Friday morning I was sent to the Field Ambulance with ‘Pyoremia’ (sic) (2) – don’t be frightened at that word ’tis not half as bad as ‘catarrhal j———- oh! I don’t like to write it even. Tis only sore feet and a few other breakings out. And so this Sunday finds me at the Casualty Clearing Station, a kind of Hospital (3). Do not be sorry for me, I am sorry for you, but then again the contents of your ripping parcels will be highly appreciated among my chums & especially the other chaps in my section who have rarely had such luxuries as figs, dates & a rich plum cake. I have told the Corporal* (4) over the section to divide the parcels among them; no parcel s have been forwarded to me. We moved to this C.C.S. this morning. I advise you not to trouble writing to me until I get back to the Battalion again. The doctor said I should take more than a week to get better, but then my address is not certain. I cannot tell you anything more definite. 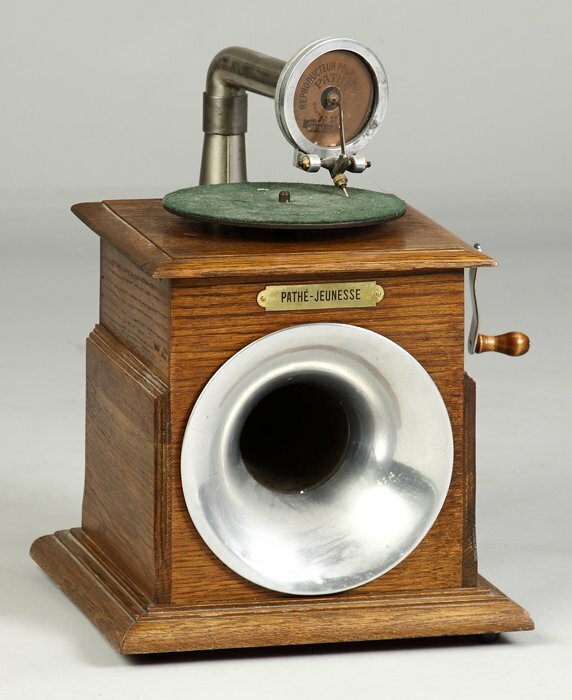 Pathephone Record Player.1916. cf Letter 20th August 1915. I am very comfy here, there is a gramophone on and we have just had ‘Eternal father strong to save’ (5 ). That reminds me, I wonder how Sydney is now. I pray that he is having a quiet & happy Sunday, – & you too, with Harold at Home, as he was last Sunday. Your letter of last Sunday was a nice one & I knew as much that you & I would be thinking of Sydney & one another. By the time you get this, & the other of my Christmas letters to you all, it will be very much nearer the season. Hibbett Family Photo c.1906. In Khaki Case. 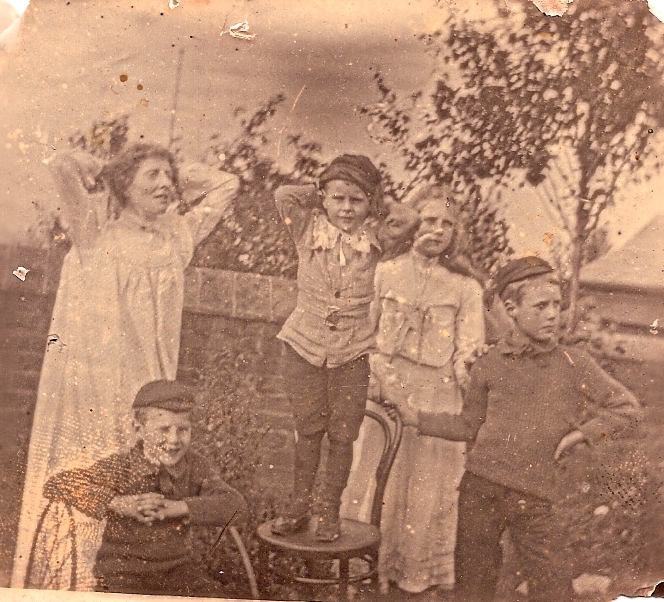 From Left : Mother, Bertie with hoop, Basil, Ida & Sydney ‘who did not like his photo taken’. I have just had a look at you Mum – & all of you in my little Khaki Case. 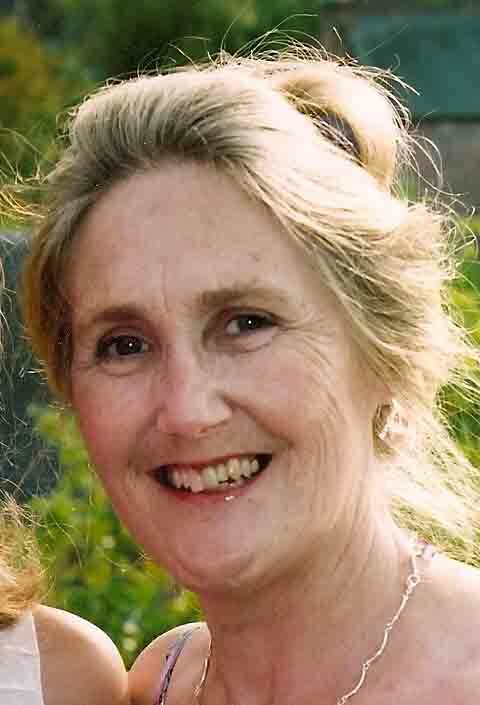 I am sorry I cannot send you a smile like I did last Christmas at Saffron Walden & a Card, so I send you Auntie’s (6) & it will partly be mine to you won’t it? now I have parted with it. And, as Dodger said he would like to see me I have cut myself out & sent you a smile. What do you think of my ghost story in his letter? As luck would have it Vernon, Sydney and I look far from spending Christmas together & the Trio is away from the Batt. too & we are all in Hospital – how funny. 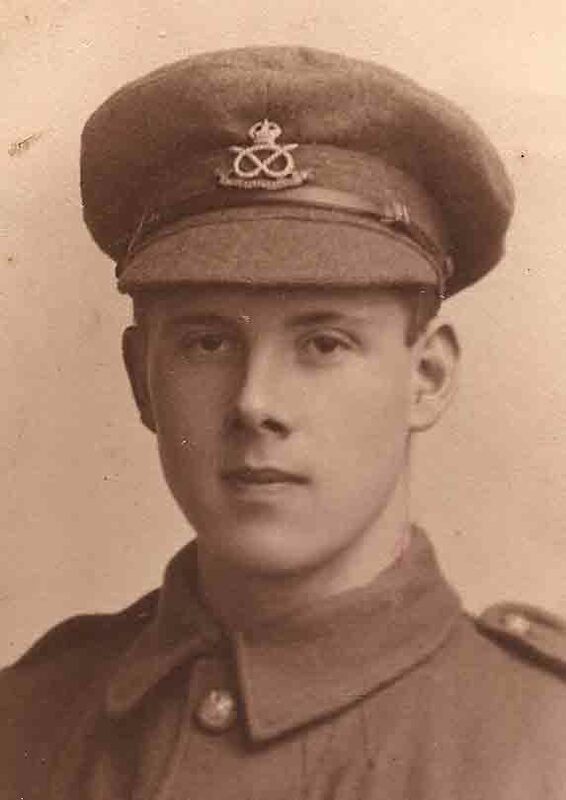 Vernon went to the Field Ambulance a week last Sat & left the morning I arrived, only a few hours before, so that I could not wish him the best of luck and a Merry Xmas. I do hope dear Sydney will enjoy some Christmas fare. Have you sent him a parcel? I do hope he gets his, but he will sure to of course. You had better write to Miss Foster*as well as I don’t want another muddle in correspondence. A. O. Jones* will very likely acknowledge my parcels. He has got a stripe to enable him to get a Commission. Every applicant must have had two months as an N.C.O. to get a Com: I put the matter to my platoon Commander the other day before I left the Batt. but did not see him again to hear his answer. Yes, as you say, it will be Christ’s Birthday on the 25th & everyone can rejoice in the right way. See Thessalonians 4th Chapt. from verse 13 to end ‘Wherefore comfort ye one another with these words’. I am writing to Mrs Penning* (7) for Christmas. God bless you dear Mother & He will let you see me in His good time. I do like your conclusions to your letters, but don’t trouble staying up late to write. I pray that you may have happy goodnight sleeps. May you have a Happy Home all together this Xmas. Your very affec. son, Bertie. Pte Bertie Hibbett’s movements are clarified here. On 17th Dec, he was due to march from Rue des Vaches to Isqberque but because of the state of his feet he was sent instead to the Field Ambulance Advanced Dressing Station ADS (where he just missed his pal Vernon who had gone on to Hospital in Bologne with a similar complaint). By 19th Dec. Bertie was at Merville Casualty Clearing Station (the next stage of the Divisional Casualty Evacuation Chain, organised by the RAMC. This Letter is typical of those he sent his Mother, a determined attempt to alley her anxiety for him with comforting words of the Christian Faith & the true meaning of Christmas. (1)Philippians 4. 4-8. (2) Pyaemia: Blood poisoning (septicaemia) characterised by pus-forming micro organisms (usually Staphylococcus) in the blood /leading to widespread abscesses/ boils (fr Latin puon -pus /haima-blood. A very serious condition in the absence of antibiotics. (3) Merville C.C.S. Casualty Clearing Station (approx 8 miles West of Estaires. (4) A.O.Jones* recently made Corporal in preparation for Commission? (5) Eternal Father Strong to Save. The Seafarer’s Hymn. William Whiting. 1860. (6) Auntie Pattie* of York’s Xmas Card. (7) Mrs Alice Penning*: Bertie’s billet Landlady, Gold Street, Saffron Walden, 1914. Lost her son, Arthur Penning, K. in A. August 1915. (6) Base: the Brigades’ ADS Advanced Dressing Station. cf Letter: 14th Dec. 1915. Christ's Birthday.Christmas Parcels.Commission.Isberques.Khaki Case with Family Photos.Merville casualty Clearing Station.Pathephone Record Player 1916.Penning Family. Gold Street Saffron Walden.Philippians 4.4-8.Seafarer's Hymn' Eternal Father'The Seafarer's Hymn 'Eternal Father'.William Whiting.WW1 Advanced Dressing Station.